We address the problem of geo-registering ground-based multi-view stereo models by ground-to-aerial image matching. The main contribution is a fully automated geo-registration pipeline with a novel viewpoint-dependent matching method that handles ground to aerial viewpoint variation. We conduct large-scale experiments which consist of many popular outdoor landmarks in Rome. The proposed approach demonstrates a high success rate for the task, and dramatically outperforms state-of-the-art techniques, yielding geo-registration at pixel-level accuracy. 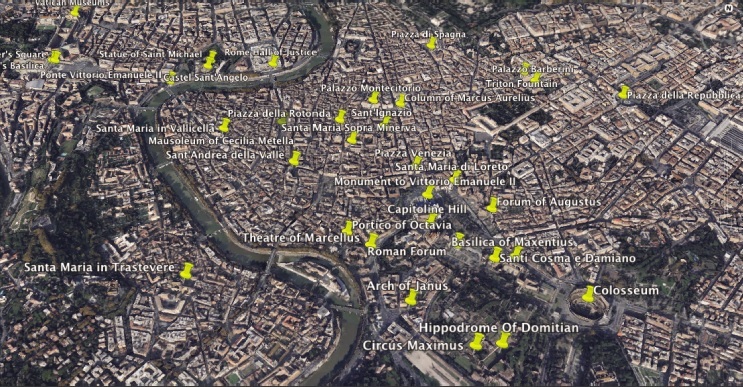 3) a largescale geo-registration evaluation which consists of the most popular outdoor landmarks in Rome, demonstrating an approximately 70% (41 out of 59) success rate. 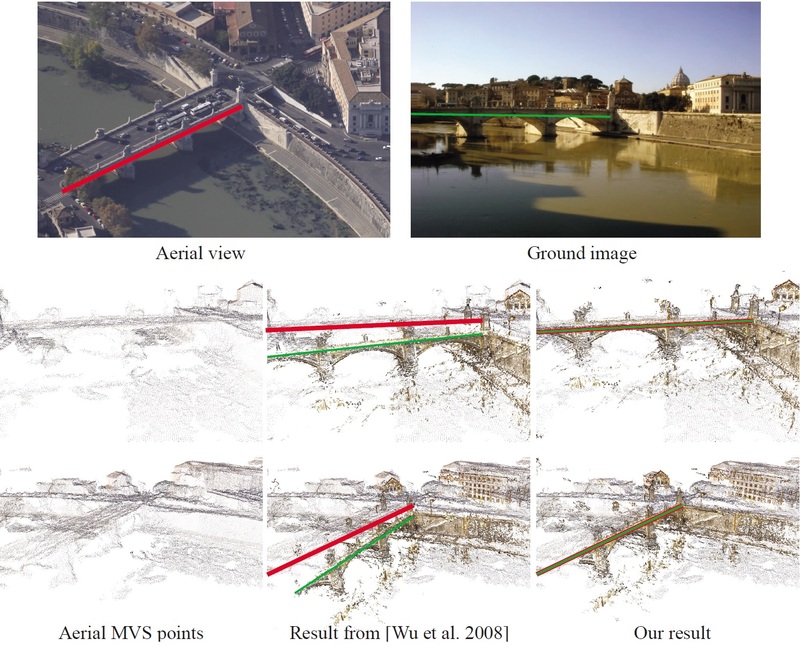 Accurate geo-registration of ground based Multi-view Stereo (MVS) models. Left: an MVS model from geo-located aerial images. Middle: the ground model is successfully geo-registered using the proposed method. Landmark: Castel Sant’Angelo. We show results comparison against VIP matching in [Wu et al. 2008]. For better visualization, we manually place red and green lines to highlight the bridge beams in aerial and ground models, respectively. Note that the geo-registration from the proposed method is more accurate as the bridge beams from the aerial and ground model overlap. Landmark: Ponte Vittorio Emanuele II. C. Wu, B. Clipp, X. Li, J.-M. Frahm, and M. Pollefeys. 3D model matching with viewpoint-invariant patches (VIP). In CVPR, 2008.